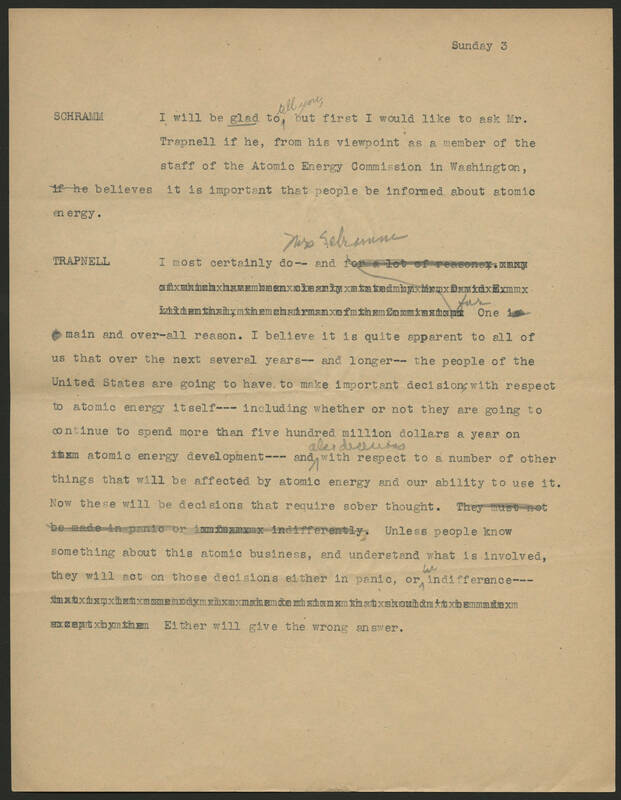 Sunday 3 SCHRAMM I will be glad to tell you, but first I would like to ask Mr. Trapnell if he, from his viewpoint as a member of the staff of the Atomic Energy Commission in Washington, believes it is important that people be informed about atomic energy. TRAPNELL I most certainly d-- and Mrs. Schramm for one main and over-all reason. I believe it is quite apparent to all of us that over the next several years-- and longer-- the people of the United States are going to have to make important decisions with respect to atomic energy itself--- including whether or not they are going to continue to spend more than five hundred million dollars a year on atomic energy development--- and also de(? )ons with respect to a number of other things that will be affected by atomic energy and our ability to use it. Now these will be decisions that require sober thought. Unless people know something about this atomic business, and understand what is involved, they will not on those decisions either in panic or in indifference--- Either will give the wrong answer.